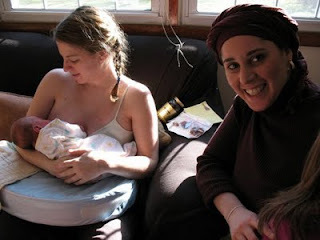 In response to my call for birth stories featuring doulas, Avital of Mamafesto shared this beautiful story about her birth and her wonderful doula, Chana Luba. Enjoy! If you have a doula birth story that you'd love to share, either about how indispensable your doula was or a doula birth from your own perspective, please feel free to send it my way - I would love to feature it! I was five months pregnant when we moved. We knew in our hearts that we had moved for all the right reasons, but it still felt so terrifying. We were moving further away from our family and friends, and knew less than a handful of people in our new town. My husband's work had him away for long days and sometimes nights, and while I wasn't working, I was finishing up my thesis project for my master's degree. I spent most of my days working diligently on my thesis while taking occasional walks into town as my belly expanded. I visited coffee shops and art galleries, book stores and boutiques, but still felt a lack of community. Having already sadly shelved the notion of a home birth for a variety of reasons, I did my best to immerse myself in the various programs the local hospital offered pregnant mothers. Around my seventh month of pregnancy I started taking a prenatal yoga class, held in the community room of the hospital. It was there that I met my soon-to-be best friend. She was pregnant as well, only a couple of months ahead of me. She had lived in the area for a while, and as we got to know each other, my desire for community started being fulfilled. It was through her that I learned about the work of doulas. She was actually a doula in training at Maternal Wisdom and suggested I call the woman she studied with. I took the information home with me and let the idea percolate in my brain for a bit. A person that would help me throughout my labor and birth? Wasn't that what my husband was for? The more I thought about it, the more unsure I was. The concept sounded interesting, but wouldn't the cost be prohibitive? I wanted to talk to my new friend about the idea of a doula more, but she ended up going into labor and was occupied with her newborn daughter. In the end, I called up Chana Luba Ertel, the doula behind Maternal Wisdom and it was there that my community continued to solidify. The first time we met, all of my hesitations and concerns seemed to melt away. It was as if Chana Luba could sense what we needed and worked to give us that. After we had made the decision to have her attend our birth, everything seemed to be that much easier. We met frequently and she gave us a few exercises to practice while we were apart. She answered all of my phone calls and emails (some made in non-rational pregnancy induced panic) with grace, humor and kindness. Toward the end of my pregnancy, when I was having prodromal labor for what felt like a week, she helped by visiting me at home, providing me with not only alternative treatments to urge along the pregnancy, but reassurance and strength as well. The night I went into actual full on labor, I finally relented and called Chana Luba around two in the morning, feeling bad for waking her. She of course only had words of encouragement and reminded me to hydrate, eat a little if I could, and relax. She arrived a few hours later as things began to pick up. From then on, she was the guide to our ship, allowing me to labor as I had hoped for, while allowing my husband his own space as well. When my contractions began getting more painful, she drew me a bath, and then, when my water broke in the bath and the pressure and urge to bear down became too strong, she hustled us along to the hospital. I was able to stay at home as long as I did because she was there. Despite birthing in a hospital setting, I wanted to labor at home as long as possible and got my wish. Her support continued as we made the short, five minute trip to the hospital. I arrived between shifts and a midwife from my practice didn't see me for another twenty minutes. A nurse began taking vitals and became concerned when she noticed the baby's heart rate had decelerated. At that point, had Chana Luba not been with us, I have no idea what could have happened next. I was mid contraction and not fully present and my husband was concerned for both me and the baby. Chana Luba suggested I change positions, and that immediately helped the baby's heart rate go back up to normal. A little while later she went off to get me some juice and a banana on the sly to help keep my energy levels up. Only a couple of hours later my son was born, and some of those first few pictures we have of him include Chana Luba. She ensured that we stuck as closely to our birth plan as possible and helped us to navigate the unfamiliar. She stepped in and helped us out when we needed it, allowing us to stay the course we were on instead of heading down the slippery slope of intervention, which was my biggest fear with a hospital birth. She already had a relationship with this particular hospital, which made many things easier for us, including allowing me to leave only a few hours later. Her help didn't stop there, however. In the days that followed, she remained in touch, checking up on me and making sure our nursing relationship was going well. She provided me with homeopathic treatments and herbs for a range of things from post-partum hormones to nursing woes. She was also there for me like nobody else eight days post birth when I needed her the most. She truly embodies the name behind her business, Maternal Wisdom. A former teacher and lifetime learner, Avital Norman Nathman is a play-at-home mama, freelance writer, wife and feminist (and not necessarily in that order). When not gardening, cooking or dancing around the house, you can catch her musing about motherhood and feminism at The Mamafesto.